Our approach to rose selection is to only use roses that would have been growing in New Zealand before 1900. However, we also made it a priority to plant the roses saved from early settler gardens in Glenside, even if these roses date after 1900. We selected heritage roses that are written about positively by New Zealand rose experts for their beauty and their resilience against disease, insects and wind. 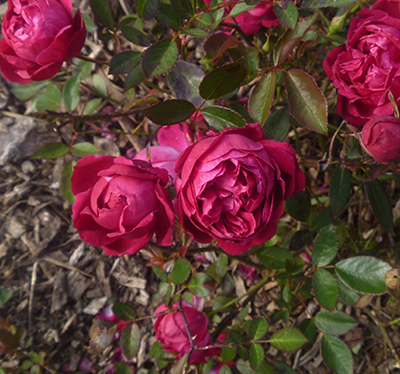 The most vigorous climbing roses are planted along the poplar tree row. One day the poplars may be felled at hedge height, however by then the roses will have billowed up into a hedgerow, providing an alternative shelter for the orchard. The roses are photographed in the Halfway House garden. Charles de Mills. 1790. (x 4). Best known Gallica. Fully open flower 125mm across. Colour extends through maroon, crimson, purple, lilac and grey. In full flower a joy to behold. My World of Old Roses (Griffiths, 1983:45). Growing on 1843 Tuamarina – Wairau battle site, Blenheim. The Charm of Old Roses (Steen, 1994:9). Good for a large garden and collector’s garden. 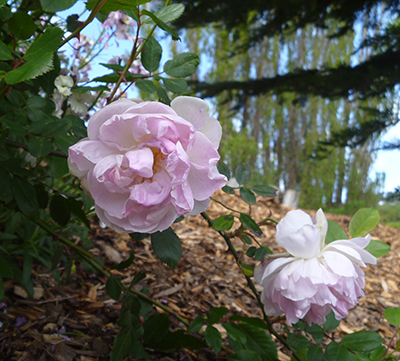 Old Roses for New Zealand Gardens (Sinclair & Thodey, 2000:59, 93). Supplier: Tasman Bay Roses, Motueka. Gifter: 3 x Heritage Gardener's sales table, Halfway House Open Day 2017, with the support of Twigland Gardener’s World. 1 x Heritage Gardener's sales table, World War I The Home Front, 2018. General Gallieni. 1899. (x 3). Trusted and true. Wiry vigorous growth. Irregular shaped flowers change greatly as the seasons pass: rosy-red, buff-yellow, brownish red and dark red. My World of Old Roses (Griffiths, 1983:100). Plant two or three together to form a large clump. Old Roses for New Zealand Gardens (Sinclair & Thodey, 2000:60). Named after French General who defended Paris at the beginning of WWI in the Battle of the Marne. The Charm of Old Roses (Steen, 1994:95). Gifter: Heritage Gardener's sales table, Halfway House Open Day 2017, with the support of Twigland Gardener’s World. Slaters Crimson China. 1792. (x 3). 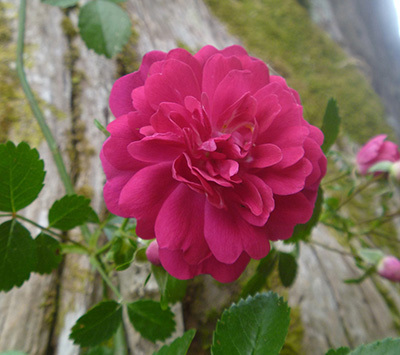 Also known as Semperflorens', 'Old Crimson China'. Semi-double flowers of crimson to red, petals sometimes with flecks of white. Low shrubby bush. 1m. Introduced to England in 1792. Said to have come to England via a Captain in East India Company. He presented it to the director of his company, Mr Gilberd Slater. Introduced to New Zealand in 1814 by Rev. Samuel Marsden at the first Mission Station at Rangihoua Pa. The Charm of Old Roses (Steen, 1994:63). "In 1789, Rosa chinensis var. semperflorens (Crimson Chinese Monthly), through the captain of an English East-Indiaman, came into the possession of Gilbert Slater, Esq. The story of the modern rose. The Garden Magazine (Wilson, 2015:253-256). Slater's gardener, James Main (1835) disputes that it arrived in England by this route and says although the rose was received by Mr. Slater in 1790, and flowered, for the first time, in his collection in 1791; the R. semperflorens was not then among his imported plants and was received through some other channel (Wilson, 2015:253-256). Gilbert Slater was a nurseryman from Knotts Green, Leyton, Essex and a manager and owner of several ships in the East India Company. Ideas of Chinese Gardens: Western Accounts 1300-1860 (Rinaldi, 2016:244). Gifter: Heritage Gardener's sales table, Halfway House Open Day 2017, with the support of Twigland Gardener's World. What is this rose? It came from the former farm garden of the Bulliman family, who lived north of Waikanae. They built their farm cottage during World War I. 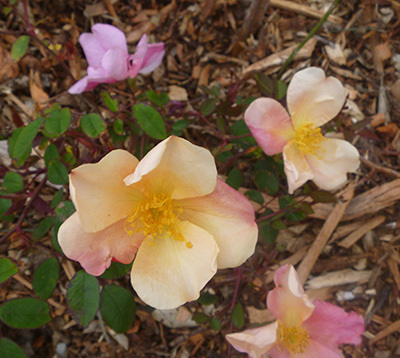 The rose has a cascading habit. It flowers once, with highly scented racemes of clustered dainty pink and white flowers, each flower about one inch diametre. The cottage was removed for the Pekapeka expressway and garden destroyed. Orchard remnants remain. 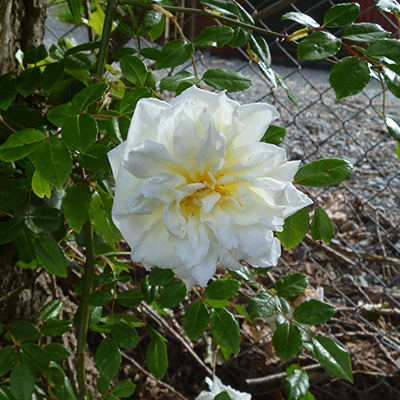 This rose was taken as a cutting from the mill town of Raurimu, where it was found growing up a tree. It is a rambler, with flowers one and a half to two inches wide. The colour is a clear soft purply red. Gifter Viv Harris says it is "tough as nails" as Raurimu receives minus ten degree weather and is blazing hot in summer, and the soil is pumice from volcanic activity. The Harris family have a club house (for the ski season) in the old sawmilling town of Raurimu, and Viv has saved and grown rose cuttings from early gardens in the old mill town. Gifted rooted cutting: Viv Harris of Ohariu Valley. Planted: Against the macrocarpa stump. Alberic Barbier. 1900. Wichuraiana Rambler. 19ft. Creamy yellow. Fragrant and vigorous with glossy foliage. Growing at Ngaio Anglican Church, the Pauatahanui Anglican Church and wild along the roadsides at Pukerua Bay. Our cutting came from the Ngaio Anglican Church garden. 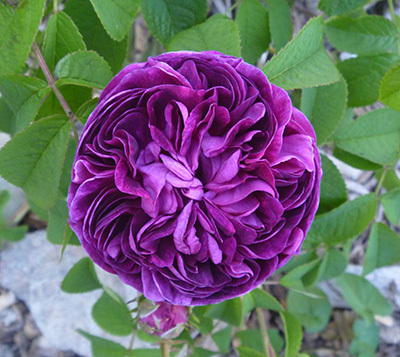 The rose was named by Albert Barbier, famous French gardener and rosarian, after his father. Planted: Along the poplar row. A Glenside rose. 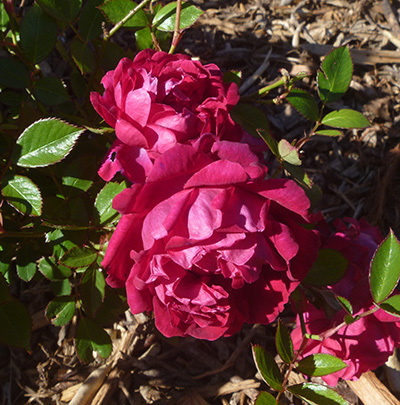 This rose is grown from a cutting taken from the original American Pillar rose growing at the Halfway House at the edge of the western verandah. 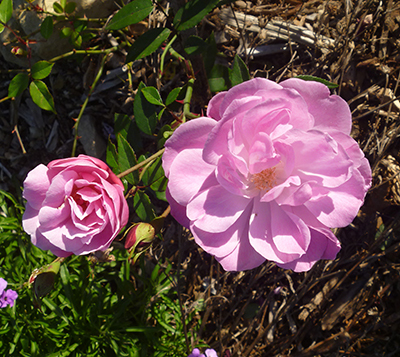 The original rose died after Wellington City Council sprayed the pest plant passion vine growing next to it. The rose was bred by an American horticulturalist, Dr Walter Van Fleet. The Banksia rose is named for Lady Dorothea Banks, wife of Sir Joseph Banks who travelled to New Zealand with Captain Cook as the botanical artist. 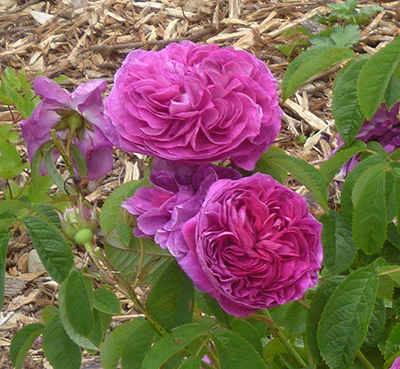 It was planted in Empress Josephine’s garden in the Chateau of Malmaison 1804-1814. The white double form is most popular in Europe. The double yellow is popular in New Zealand. The Charm of Old Roses (Steen, 1994:5, 145). Banksia Alba. 1803. Climber 32ft. Clusters of fragrant, small double white flowers with prominent gold stamens. Light green elongated leaves. Thornless. Can be grown as a stand alone rambler or over structures. Violet scented. Earliest flowering. My World of Old Roses (Griffiths, 1983:24). Suppliers: Trinity Farm, Otaki; Twigland Gardener’s World, Glenside. Planted: Under old plum tree beside the macrocarpa stumpery. Banksia Lutea. 1824. Climber 39-49ft. Growing on site of Old Mill House in Akaroa, NZ’s first flour mill. The Charm of Old Roses (Steen, 1994:147). Gifted cutting: Golder Cottage (established 1876), Upper Hutt. Cecile Brunner. 1881. 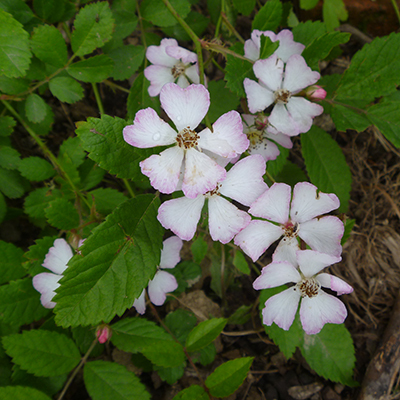 Bush rose. (x 2). Shell pink blossoms. Sweetheart Rose. Long flowering season. Fragrant. My World of Old Roses (Griffiths, 1983:137). Supplier: Harrison’s Garden Centre, Pekapeka. Charles de Mills. 1790. (x 3). Dorothy Perkins. 1901. Wichurana rambler. A Glenside rose. 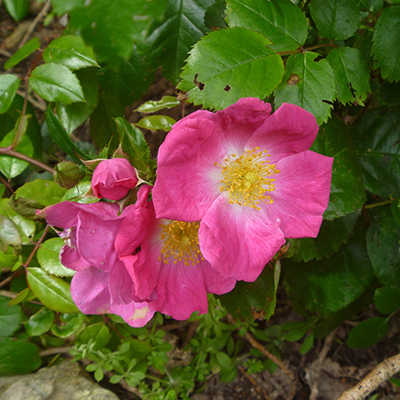 This rose, with its clear pink double blooms, has been found growing wild in three places in Glenside. These are on a hillside at the site of Drake’s garden (established c1840); on the bank above the milk-stand on the corner of Glenside and Middleton Road; and growing down a railway bank just north of the house at Ivy Bank Farm (established c1860). In the early 2000’s cuttings of the rose were taken from Drake’s and the milk-stand. It is still growing at Drake’s abandoned garden on the corner of Wingfield and Middleton road, however it does not seem to have survived at the other two locations. 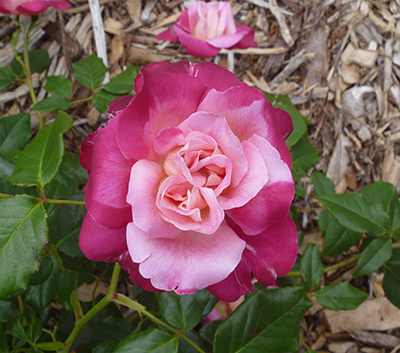 The Dorothy Perkins rose was bred by E. Alvin Miller, United States. He was a plant propagator and foreman at Jackson & Perkins wholesale nursery company. Dorothy Perkins was the grand-daughter of American rose-grower Charles H. Perkins. A Glenside rose. Found growing at Ivy Bank Farm (established c1860) on the railway bank opposite the front verandah. Clusters of bright carmine flowers about one to two inch diametre. The original form was bred in 1904 by Mr. H. Walsh of Woods Hole, Massachusetts, United States. Maidens Blush. 15th C. Bush. A Glenside rose. White, blushing pale pink, double blooms. Found growing against the shed on the road reserve outside the early settler cottage at 219 Middleton Road, Glenside. It has since been lost from this location. 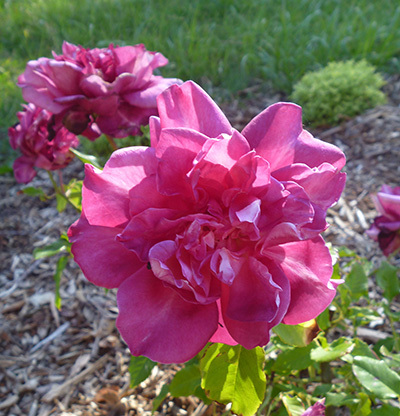 Healthy early flowering rose. Grows semi wild in North Island and Gisborne. In cemetary at Waimate North. The Charm of Old Roses (Steen,1994:154). Fragrant. Grows upright to 2 m then branches over heavy with flowers. My World of Old Roses (Griffiths, 1983:61). Planted: Along horse paddock fence line. Flower Bank. Single. Wiry twiggy growth. Flowers open buff-yellow, changing to a hazy pink and finishing bronze crimson. My World of Old Roses (Griffiths, 1983:91). Origins unknown. Originally called Tipo Ideale. Old China Blush. Pre 1750. Pale silvery pink rambler. Cutting taken from a rose growing at the site of the pioneer settler cottage (1853-1874) at Forest Gate estate, Ongaonga. 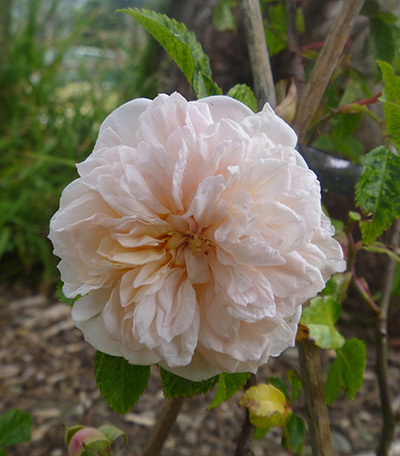 This rose is covered for the greater part of the year with dainty rosy pink flowers in sprays. It came to New Zealand with the Missionaries. The Charm of Old Roses (Steen, 1994:74-77). Paul Transon. 1900. 16ft. (x 2). A beautiful hybrid from Alberic Barbier. Free flowering, glossy foliage, strongly scented salmon flowers. My World of Old Roses Volume Two (Griffiths, 1986:141). Planted: Big macrocarpa stump, horse paddock fence line. Moved in 2018 to grow on the rose arbour and cutting planted so that one rose is on each side. Came to England via Captain in East India Company from Calcutta. He presented it to the director of his company, Mr Gilberd Slater. Introduced to New Zealand in 1814 by Rev. Samuel Marsden at the first Mission Station at Rangihoua Pa. The Charm of Old Roses (Steen, 1994:63).